Some days are the worst days, aren't they? People are making horrific choices all over the world. WE make bad choices. People around us are "intentionally" mean and impatient. I'm not quite sure that it is possible to be thoughtless on purpose, but if it were... they would be doing that as well. You know, because there is so much bad in society that it's probably just going to implode on itself soon anyway It's really not worth the effort of trying to do good any more. Except... that it is. Because there *IS* so much good still in our lives. Like a little boy dying of cancer. (Admittedly very depressing, but stay with me here.) All he cares about is making other people happy and inspiring others to be a little nicer. In fact, he spends what time he has raising money to help other children fighting cancer. Like his mother who has never ever stopped trying to make the world better. She continues trying to bring happiness to others and spread joy even when her greatest source of personal joy lost his battle on this earth. Like the entire community that rallies around that mother and that young boy's cause. Like a neighbor who organizes a bake sale and is thrilled when 60 cookie decorating friends send their creations for the first bake sale. And completely astounded that not only are they still donating 3 years later, but that they've been joined by 350 MORE decorators from 50 states and 17 countries. Like every single one of those 407 cookie decorators that have committed their time and their resources and their love to a bake sale in Eastern Wisconsin where the proceeds will go to help people they've never met...and in all honesty probably never will. There is good in the world. And thankfully, there are also cookies. 1. Pipe a squiggly line around the half way point and fill in the bottom section with red icing. If you like, add a white "shine line" along the right side before the icing dries. 2. 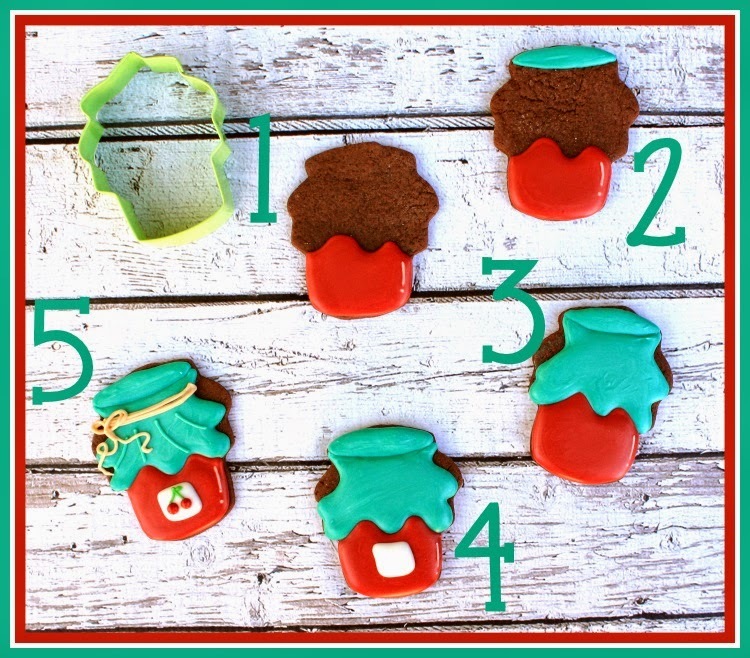 Add a squished oval for the top of the jar with teal icing. Let it dry for 15 minutes. 3. Then fill in the rest of the cookie with more teal icing. 4. If you have problems with icing colors bleeding in to each other, let your cookie dry overnight before adding the white square label. 5. 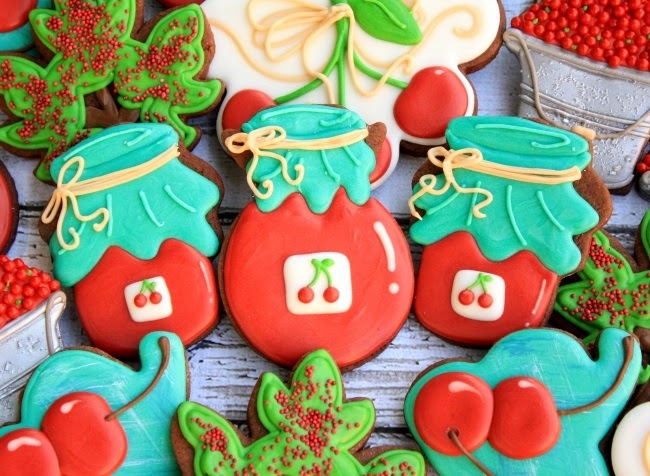 Add the cherries, string, and details lines with a #1.5 tip and thick icing. And then give them to people you love. If you want to learn more about that little boy.... click HERE. 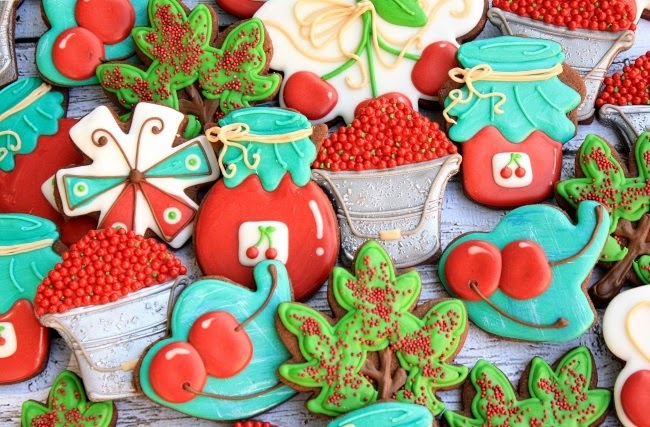 If you want to learn how YOU can join this cookie decorating force for good... click HERE.